Summary: The Tories criticism of the Labour manifesto as depending on a “Magic Money Tree” shows just how little they understand of basic economics. The austerity programme of George Osborne and the Tories has led to unremitting damage to our economy that people are now waking up to. The realisation that money can sensibly be borrowed to invest in the future of the economy is sound. It is this approach that underpins much of the appeal of the Labour election manifesto. It is the Tory lack of understanding of this is why they keep talking about it. However there is no doubt that they just don’t understand these arguments. Most economists are convinced that the Tories are simply wrong on this. Many spending commitments in Labour’s election manifesto were dismissed by the Tories as depending on a “Magic Money Tree” to pay for all sorts of investments in the UK. This criticism show a remarkable ignorance of basic economics. 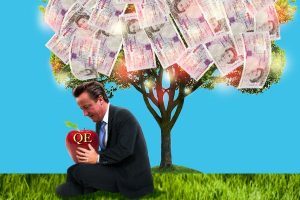 Most Tories appear to be unaware that they have depended heavily in recent times on the same Magic Money Tree. They have used it over the last seven years to produce nearly £500 billion worth of new money to inject into the economy. This program was led by the Bank of England and called “Quantitative Easing”. As the British recession advanced, worsened by the Tory austerity programme, spending and investment fell to a degree that there simply wasn’t enough money in circulation to support a strong, growing economy. Too much was being hoarded and spending needed to increase if the economy was ever to grow. The idea was that if the Bank of England purchased assets from organisations such as pension funds and large companies, those organisations would reinvest it in the UK. In fact it was much less effective than intended because a great deal of that money ended up simply shoring up the balance sheets of the British banks to meet new regulations. Companies hoarded the money rather than use it for investment so again growth was not effectively stimulated. Much of the apparent growth in the UK economy recently is not a consequence of quantitative easing. It is principally because individuals are allowing their outstanding credit card bills to increase. It is those increases that allow increased spending to make it look as if the economy is growing. Unfortunately all this extra borrowing has to be repaid by individuals. As soon as money becomes tighter there is likely to be a major drop in spending with damaging consequences for personal standards of living as well as for growth. Labour’s spending plans are in two parts. One is to increase expenditure on things like social services, the NHS and education. Labour propose funding this by increasing taxation on the wealthy and on profitable corporations. The other part involves buying key assets such as the railways and the Royal Mail as well as raising money to invest in infrastructure projects ranging from simple road repairs right up to a nationwide housing programme (see: http://outsidethebubble.net/2016/09/27/a-fairer-deal-solving-the-housing-crisis/ ). All these investments will produce a positive return. By borrowing and paying the remarkably low interest rates being charged at present on such borrowings, typically 1.5% on a 30-or 50-year loan, the boost to the economy and to our society would be substantially greater leading to a wise and effective investment. As the economy grows more rapidly, taxation receipts will increase. This is exactly the same as many of us manage to buy a house. We borrow to provide a mortgage on the property. For most of us this is the only way we could afford to buy our own home. We pay interest on that mortgage and gradually pay back the loan. We end up owning a property, a good investment. At the same time our day-to-day living expenses are balanced against our income from all sources. That is what we do with our personal finance and Labour is simply proposing doing that with the nation’s finance in exactly the same way. The big mistake that the Tories, and particularly George Osborne made was to try to pay for things that were genuine investments out of taxation. They obsessively wanted to “balance the budget” because they felt that was the proper thing to do. Within the Eurozone it is an obsession particularly of the German Economics Minister, Wolfgang Schauble, that pushed countries such as Greece, Ireland and Portugal to the brink of economic collapse and indeed nearly forced Greece out of the Eurozone altogether. Economists quickly realised obsessive austerity was simply nonsense. Countries that are growing fastest now are the ones that have abandoned austerity if they ever tried to implement it. The UK is one of the last countries still pushing austerity. That is why our growth rates are so moribund. On average people in the UK are less well off in real terms than they were before the recession started nearly 10 years ago. Fortunately the British public now understand just how inappropriate austerity is and have voted for a change. The change that Labour want to implement will rebalance substantially our economy by increasing taxation on the wealthy, both individuals and corporations, and then using that income to fund the NHS, social services, education, welfare and so many other areas.